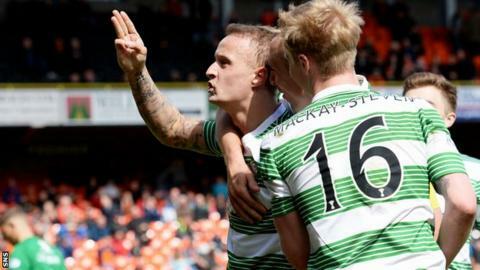 Celtic manager Ronny Deila thinks Leigh Griffiths is at the top of his game after the striker scored his second hat-trick within 11 days. The Scotland cap initially found it difficult to win a starting place after Deila took charge in the summer. "He's delivered and that's what you need to do to get on the pitch and show everyone you are good enough," said Deila after the win over Dundee United. "Now his contribution is at the top level." Celtic could retain the Scottish Premiership title next weekend if they defeat Dundee on Friday and Aberdeen drop points to United the following day. Deila hopes his side can clinch their fourth straight championship as soon as possible as he admits that some of his players are jaded after a campaign that began with Champions League qualifiers last summer. "This is a good learning for everybody," he told BBC Scotland. "It is good that we have a big squad." Griffiths' third goal came from the penalty spot after a tackle on Gary Mackay-Steven from John Rankin that looked outside the penalty box. "If the decision was wrong, I don't think it made any difference," said Deila. "They have some good young players coming up again. "They are quick and good on the ball, so they were tough to play against. "But, in the second half, we showed what we are capable of and we were the better team." It took until the opening minutes of the second half for Celtic to break United's resistance with the opening goal. "The first half was poor - no movement and tempo in what we do and (no) aggression," admitted the Celtic manager. "The second half was much better and we deserved to win and created a lot of chances - very pleased with that. "We talked about it at the break and got a very good answer. "In the second half, we were a team you can be proud of."